In one old-old fairy tale, three little pigs argued enthusiastically about what is best to build a house. The fairy tale is a fairy tale, but even now many developers often argue about this. It is especially important what material the external walls will be made of. After all, they are able to make the building solid, beautiful and long-lived. Walls take up to a quarter of all the costs of building a house. And if you carelessly treat this choice, then you can incur serious spending in the future. Therefore, we take into account and consider the most important criteria and factors that must be considered when choosing a material for the construction of walls at home. # 1. The issue price. Costs can be reduced by taking lightweight material for walls. Then you will not have to build a powerful and expensive foundation. # 2. Thermal insulation. Cold walls will cost too much in winter. Therefore, before choosing a material, you need to do all the calculations, focusing on local climatic conditions. To achieve the desired degree of insulation can be resorted to using insulation. If you take a material with good insulating properties, then you can not insulate the walls, but it all depends on the region of development. # 3. Labor. Time and effort can be reduced if the walls are made of large blocks, and not of small piece materials. Such walls are built 3-4 times faster and easier. The highest speed - in the construction of frame panel walls. # 4. Subsequent finishing costs. Modern smooth and aesthetic materials do not require additional wall decoration. You can save on this. In order to determine what is better to build the walls of the house, consider the main types of suitable building materials, we define their characteristics, advantages and disadvantages. A brick house can stand for 100-150 years. It will perfectly survive and rain with hurricanes and hail, and severe frosts, and withering heat. Lay the walls of brick from ancient times, so the technology of their construction worked out to the smallest detail. Accordingly, it is easy to find a good master. Ceramic bricks have a red color. 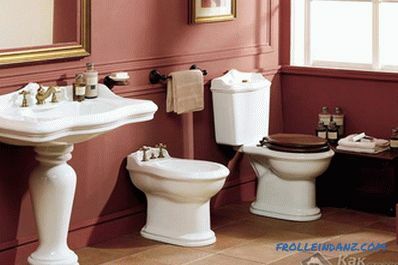 It is made of baked clay, so it is very durable and has a high environmental friendliness. Such material is not afraid of cold and does not let water through. It can be corpulent (no more than 13% of voids) and hollow (up to 49% of voids). The shape of the holes in the brick can be round, square, oval, with an arrangement horizontally or vertically. With the increase in their number of insulating properties improved. Silicate brick is white in color. Its main components are lime, sand and a small fraction of additives. This type of brick is also produced as a solid, and with cavities inside. The latter is lighter, and the walls are much warmer (for the air is an excellent heat insulator). But a solid silicate brick can pamper the developer with a variety of colors. For the strength of a brick, it does not matter whether it is solid or with cavities inside. Ordinary bricks are also called building bricks — they are used for internal masonry walls. For him, small cracks are not considered a marriage. It does not matter if the corners or edges are slightly repulsed, there are notches in the corners. The face (facing) brick must have a flawless appearance, not have any notches and flaws. 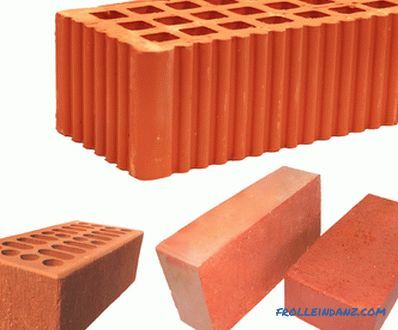 Some types of facing bricks. Strength determines the brand of brick. For this indicator, there is a special marking: the letter M and the number next (from 75 to 300). This number is the load withstanding per brand per square centimeter. The higher the number, the heavier the brick. For the walls of a two-story or three-story building, the brands M100 and M125 are suitable. 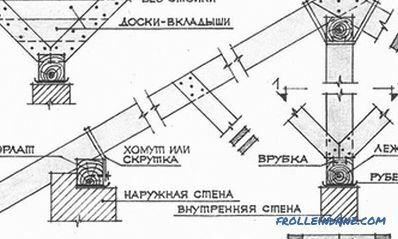 The basement or foundation is laid with brick М150 or М175. When choosing from which brick to build a house, it is necessary to take into account the frost resistance (the ability to freeze and thaw, without damaging). To indicate this indicator, the letter F is selected, next to which is a number from 15 to 100. It means the number of freezing and defrost cycles without damaging the material. In warmer areas, F15 is sufficient for external walls; where it is colder, F25. Facing is usually made brick brand F50. Ability to implement any complex project. Big expenses for paying a good master. Resistance to corrosion, mold and fungus. The requirement of a solid foundation. Nonflammable. Need to use a heat insulator. 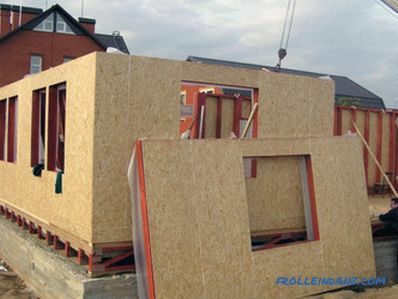 In Europe, deciding what material to build a house from, they often choose a keramoblock. It is eco-friendly (it consists of burnt clay mixture with wooden sawdust), and it can be built cheaply and quickly. Such a house will last at least 150 years, and it can be made multi-storey (a margin of safety allows it). The sides of the keramoblock are corrugated on the sides, and inside are pores. Individual elements are joined with a groove-tongue joint. The dimensions of ceramic blocks are different, but they have a standard height equal to the brickwork. This is convenient - you can build a brick house project. A block of 50 x 24.8 x 23.8 cm in size weighs 25 kg, and by volume is equal to 15 bricks of 3.3 kg each. It is easier and faster to put one such plate, and less solution is needed. The width of the blocks are 23, 24 and 25 cm. Their length (determining the thickness of our walls) can be from 25 to 51 cm. On this side is a tongue-and-groove lock. For the laying of the bearing wall, blocks are taken that have a length of 30 cm. And if you make walls 38 inches thick or more, you will not need to warm them. After all, porous blocks have a low thermal conductivity - from 0.14 to 0.29 watts per square meter per degree Celsius. Thicker blocks (38, 44 and 50 cm long) are marked as M100. If thin, but reliable walls are planned, then it is possible to take blocks of the M150 brand. Keramoblok maintains up to 50 cycles of freezing and defrosting. This corresponds to the brand F50. Small weight, coupled with high durability allows you to build even multi-storey buildings. And quickly and without any extra effort. High price - this material for the walls of the house belongs to an elite group. The mortar is used more economically than for brickwork - there is no need to apply it in vertical joints. It is difficult to find a good master for building walls, since the material is fairly new. Frost resistance at a high level. Ceramoblocks are very fragile, therefore they should be transported and stored very carefully. The material is able to withstand a fire for at least 4 hours. Due to its porosity, the ceramic block perfectly absorbs noise and also keeps heat. The walls of these blocks "breathe", adjusting the humidity and creating an excellent microclimate. Such a house serves up to 150 years, while the thermal characteristics of the walls do not deteriorate. Aerated concrete blocks look worse than a ceramic block, but they keep heat warm. The walls of aerated concrete with a thickness of 30 - 40 cm. Built in the same layer have the same characteristics as the multilayer made of brick or ceramic blocks. At the same time, a sufficiently comfortable microclimate is kept indoors, since aerated concrete effectively resists temperature and humidity fluctuations. This material will not rot and deteriorate from time to time - because it has an unlimited lifespan. And for thermal insulation, it is 3 times better than a brick. This is due to the air pores inside the material. 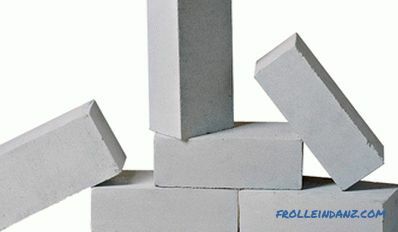 Structure of aerated concrete blocks. It is cheap to transport and easily mount aerated concrete. If you need to cut a block, then an ordinary hacksaw perfectly copes with it. Solution or special glue need a little, construction is fast. If the laying is done on glue, then it turns out thin-seam, which contributes to better insulation of the room. Made in the factory, lightweight blocks have a perfect cut, so that the walls are quite smooth. 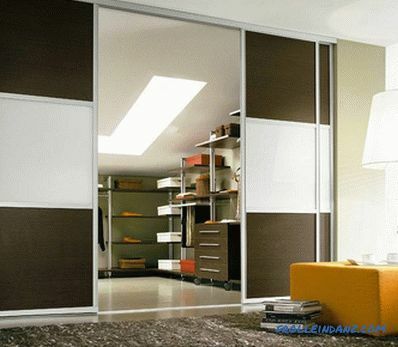 This allows you to save on interior decoration. Aerated concrete blocks are lightweight, which reduces the cost of transporting them, and this material can be used at various stages of construction. In view of the fact that the material is very easily processed, has a small weight and large size, the bricklayer makes less labor. 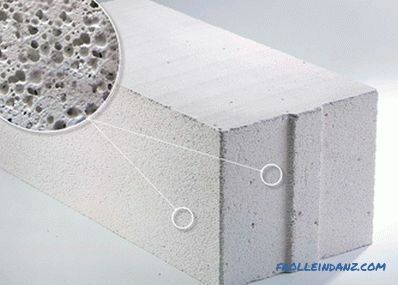 Aerated concrete is not combustible material, which has a good indicator of compressive strength. It is made exclusively from natural ingredients and is absolutely eco-friendly. This material is quite cold-resistant, and the level of vapor permeability of a house of aerated concrete can only be compared with a house built of wood. 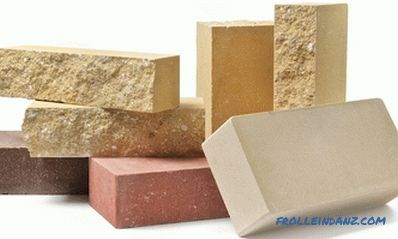 Varieties of aerated concrete blocks. For aerated concrete, density is the most important characteristic (D). It can vary from 350 to 1200 kg. / m 3 . Depending on the density, grades of aerated concrete are distinguished, denoted by the letter "D" and a number. For the construction of the cottage, it is better to take the brand D500 - D900. 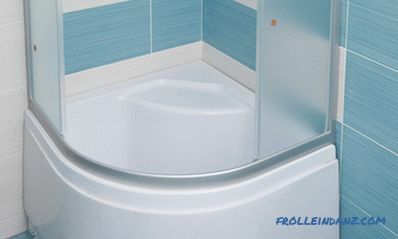 The unit with standard dimensions (20 x 25 x 60 cm) weighs 18 kg. 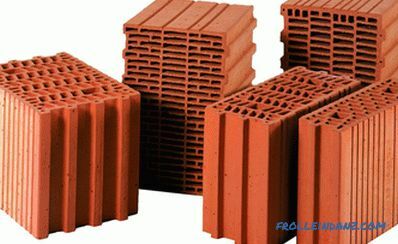 It will replace up to 20 bricks (total weight up to 80 kg). 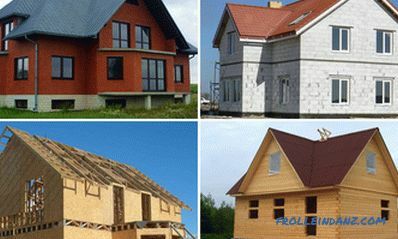 Therefore, if you have not yet decided where to build a house, take a closer look at this material. Read more about it in the material: Aerated concrete blocks drawbacks and declared characteristics. The master puts light aerated concrete 9 times faster than a brick. After all, movements need to be done less. Flexing strength is low. The geometric dimensions of the blocks are accurate. The smooth surface allows not to use additional alignment. Over time, the material may crack. Compressive strength is excellent, thermal conductivity is very small. When storing aerated concrete blocks on the street, you need to cover them well from the weather. Fire resistance is high. And thanks to only natural components in the composition of the aerated concrete in a fire toxins are not released. A solid foundation is needed. Due to its porosity, the material withstands frost well, and allows steam to pass as well as wood. People who wonder what it is better to build a private house often come to mind it is this material. After all, a wooden house is health and comfort. Its walls not only "breathe", but also make the air healing, retaining all harmful substances. Walls of wood create an optimum humidity indoors and smell good. The walls of the house made of wood have good thermal insulation and retain heat in winter and cool in summer. The cost of heating a wooden house can be significantly lower compared to brick walls. This method is the oldest, our grandfathers and great-grandfathers used it. This is a hand-made log house. The tree trunk is cut to the desired length, and then locks and grooves are made on it. Next, the logs are connected, laying out the outlines of the house. Be sure to wait for shrinkage - it's about a year, no less. Then they caulk the gaps and sheathe the windows and doors. Today, this method of building a wooden house is not used. Everyone can build a house of logs. Such a structure is going, like a constructor, let's talk about this further. Neat smooth logs are processed under production conditions and labeled. Ready-made parts from which walls are assembled are delivered to the construction site. 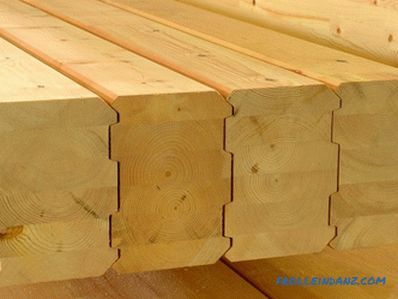 The timber can have various sizes and cross-section (rectangular, square, in the shape of the letter D). If it is profiled, it has protrusions and grooves for the connection. An oblique cut helps to drain excess water. A house of this material can be built with your own hands. 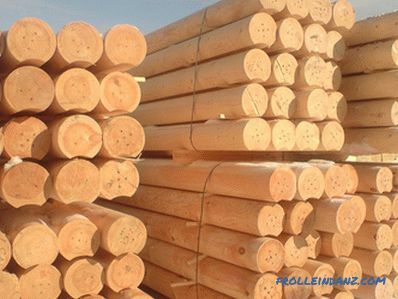 The sawn timber is made from a log with a humidity of 50 to 70%. As soon as it is cut, he immediately goes to the construction site. Because of this, the house is prone to shrinkage (up to 10 cm). And on the walls sometimes appear cracks. 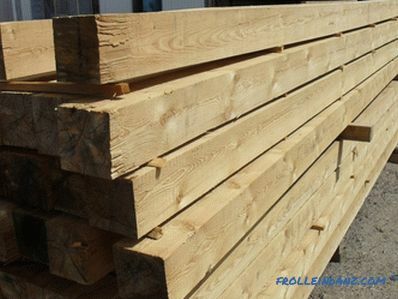 Sliced ​​timber is dried under production conditions. Humidity of the finished product - from 20 to 25%. After drying on a special machine, the product is scouted. As a result, the shrinkage of the house, although it exists, is very small. Glued beam is made of several layers of slats (special boards, dried to 6 or 10% humidity). They are glued under pressure, while the fibers of the adjacent layers are arranged perpendicular to each other. Finished products have a length of up to 12 m, and thickness - from 7.5 to 30 cm. They do not shrink, do not deform and do not go cracks. Therefore, many people believe that just glued timber is the best material for the walls of a wooden house. This is one of the most environmentally friendly materials. The tree is burning, it can rot and be eaten by the fungus. To prevent this, all parts need to be treated with special preparations. Building a wooden house is not as expensive as a brick house. Shrinkage of a log house can go from 3 to 5 years. Wood has a much better thermal conductivity than brick. Sliced ​​timber and log cabins may crack. The wooden house is very beautiful. Often it does not require finishing either inside or outside. The foundation is light and inexpensive. For example, columnar. A wooden house, especially hand cut, serves for a very long time. And from which it is cheaper to build a house? For some, the answer to this question is most important. Then look at the frame technology. In addition to the low cost of such a home, the assembly speed is also impressive. Just a few weeks - and you can move into a five-room house, which will be warm and comfortable. The basis of such buildings is a frame made of wood or metal. It includes rafters, racks, trusses and other elements. Then the insulation is put, and on top of all this is sheathed with thick sheets of chipboard or OSB. The wall of this house weighs 15 times less than brick. Expensive wood for the frame is a bit - 5 or 10 times less than for log. Insulation - the main item of expenditure. However, even the best one, it gives the cost of a wall 1.5 times cheaper than that of a bar, and compared to a brick, it gives 2.7 times less. The frame-shield house is assembled from pre-fabricated shields. First connect them, then make the partitions between the rooms. The final stage - the construction of the roof. 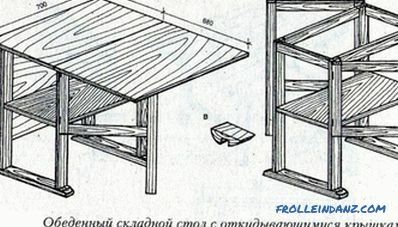 The frame-frame house is made on the basis of a "frame" - a skeleton of bars and logs, which is based on the foundation. Next, put the rafters and crate. After the manufacture of the roof sheathe frame with insulation (mineral wool or PPS). At the end, the outer skin is made. 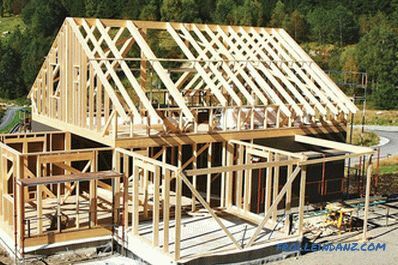 Since the main material for the construction of a frame house is insulation, when the correct calculations are made for the required amount, the structure is quite warm. What will allow you to save considerably on heating. Extremely low price and quick installation. The walls are not very strong - they can be easily pierced with something sharp. Good heat saving (when heating is turned off in the cold at minus 10 ° C, the temperature will decrease by 2 ° C per day). A framed house will last less than a brick or wooden one. Finishing is not necessary inside, which reduces costs. Not enough space for fantasy - usually take typical projects. Redesign and improvement of such a home can be done easily. The walls do not "breathe", so you need to do good ventilation. Communications can be hidden inside walls, which saves space. great dependence on the quality of the material and specialists.